Making your own drum triggers for recording is easy and inexpensive. 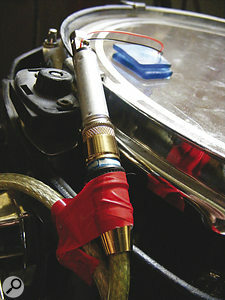 Pictured above is a 'finished' trigger, with a piezo transducer fitting snugly between two Moongels on the drum head, and the jack socket and attached jack-to-jack cable mounted on the drum using electrical tape. 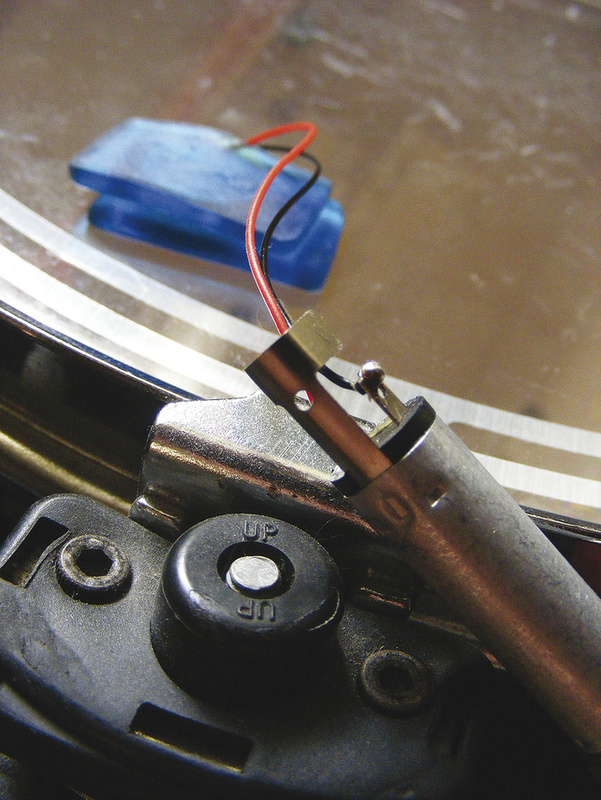 In last month's SOS, we discussed the techniques and technologies used to trigger drum samples (you can read the full article at /sos/mar11/articles/cutting‑edge‑drums.htm). One recommendation we made is that if you know in advance that you're going to be using drum-replacement techniques during the mix, it's a good idea to use hardware triggers to capture a nice clean transient spike, because this will make setting up your sample‑triggering software much easier. If you intend to do a lot of triggering, whether live or on stage, it makes sense to invest in some robust commercial triggers, such as those made by Ddrum. Not only are they sturdy, they're also designed for easy, unobtrusive mounting on the drum. Such triggers aren't cheap, though, so if you're strapped for cash, read on. I set myself the challenge of creating a set of triggers for the four drum shells in my own Tama kit, and within a budget of £10 (which is about $16)! Materials are simple. 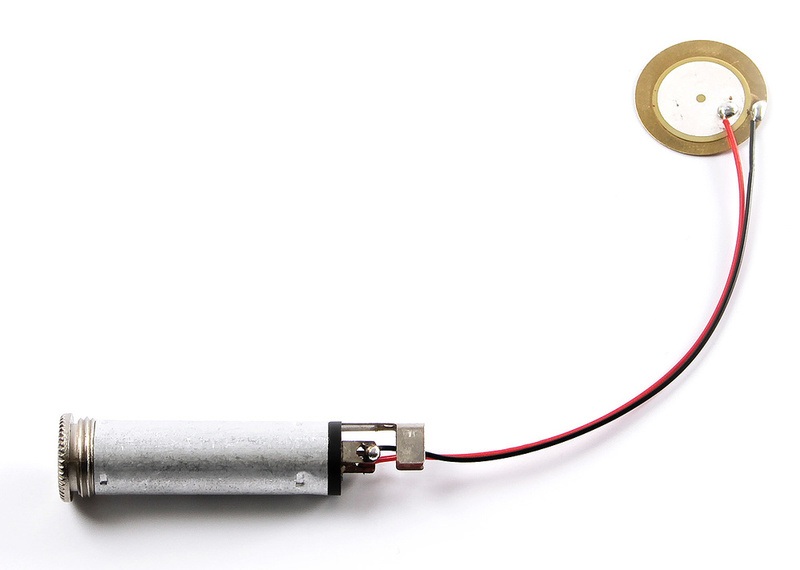 Each drum's trigger, at its most basic, need comprise no more than a length of cable, a piezo transducer (contact mic) and a jack plug or socket for each of the drums you wish to trigger. The only other things you'll need are a multi‑channel audio interface, suitable triggering software, and — if you really want to screw the costs down — a soldering iron and some solder. A cheap bench‑top vice will make soldering that bit easier too. 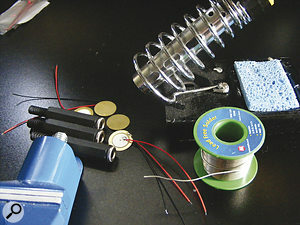 All you need are a few piezo transducers (inset), some jack sockets and basic soldering equipment. The vice is handy too! 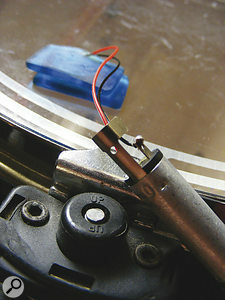 Then it's a simple matter of soldering the transducer's wires to the jack socket. The first step is a simple one. Switch on your soldering iron, tin the tips of the leads trailing from the piezo transducer, if they don't come ready tinned (mine did), slip the tips of the wires through the holes in the jack-socket terminals, and then solder them in place (see photos overleaf). I'd recommend holding the socket lightly in a vice while you do this — well, either that or drafting in another pair of hands! If you're feeling squeamish at the prospect of soldering, there are alternatives. I suppose you could instead cut a ready-made jack socket lead in two and fix the ends of the wires into screw terminals — those moulded plastic blocks you can find in electrical or DIY stores. Alternatively, (you'll need another £10 or so if you're doing a four‑piece trigger set), you could buy piezos ready wired to jack sockets. 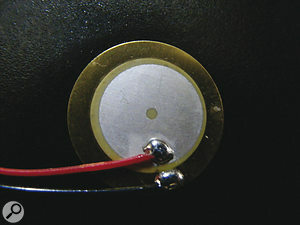 These are often marketed as acoustic-guitar pickups and can be found in many on‑line electronics components stores or on eBay. There's a potential disadvantage in this lazy route, though: I've found that it works better if you leave the strain‑relief sleeve off the jack socket, as this makes it easier to position the trigger — and on a ready‑made system, you have less control over this. You'll notice that I said jack sockets rather than plugs. 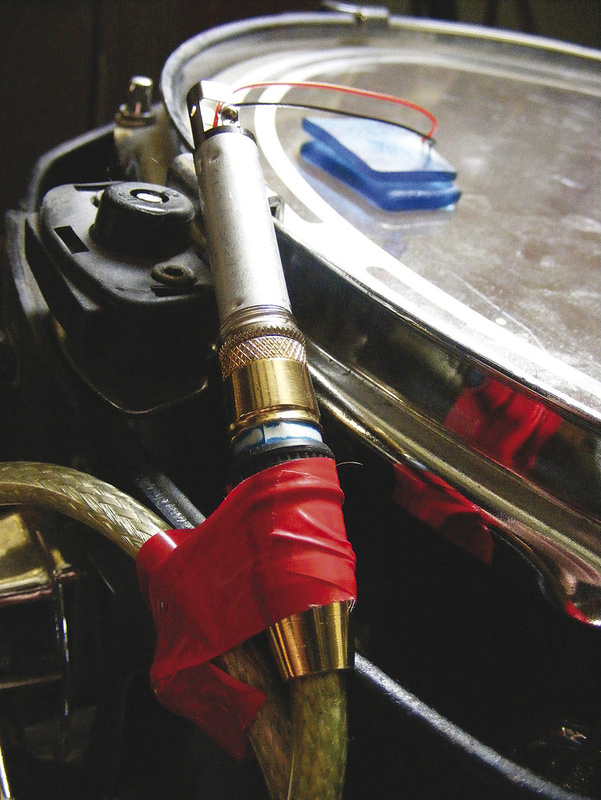 In my opinion, you're better off using sockets, because it's easier to attach the socket to a drum shell (as I'll explain later) so that it takes the strain off the piezo and its delicate wires; and all you then need to connect it to your audio interface is a standard jack cable. That's all the 'hard' work out of the way. If you now plug your assembled trigger into your audio interface and tap the piezo element, you should capture a dull click or thud. This worked for me when plugging into either an instrument or a line input. If you're having no joy, it's back to square one, because you've either done something wrong or have a faulty connector, piezo element or jack lead. Don't worry about the sound itself: at the moment it's just the timing that's important: as long as you're getting a click or thud, you're on track. 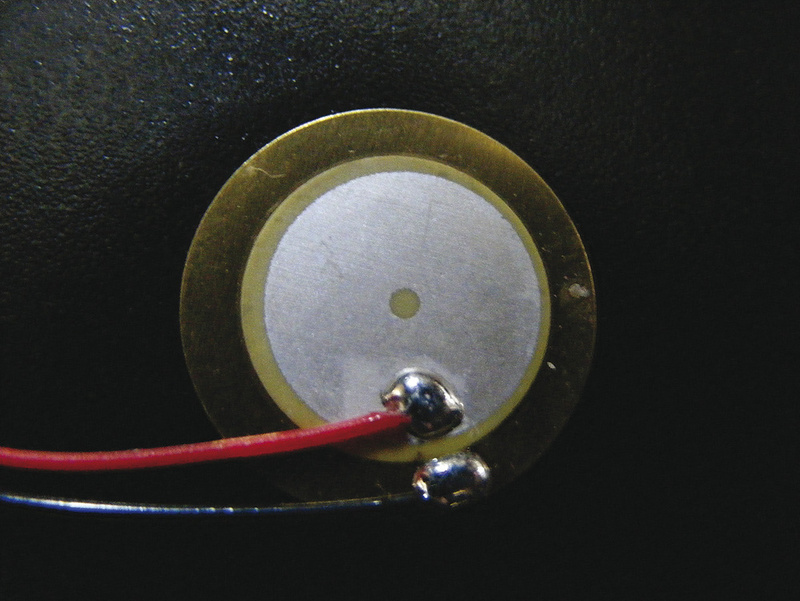 A pair of moongels provide a neat temporary means of attaching the transducer to the drum head. Now to mount the trigger on your drum. You can make this as simple or elaborate an arrangement as you like. For fixing the jack socket to the drum-mount assembly, I found that electrical insulation tape does the job well enough. This has the advantage of damping any rattling that you'd get if you used, say, metal or plastic clips. Use your imagination and I'm sure you can come up with something from the stationery cupboard that works. Next, you need a way of securing the piezo element to the head of the drum, in such a way that it's unobtrusive for the drummer and, just as importantly, at low risk of getting whacked by his sticks! I had a couple of 'Moongels' handy that did the job for me. These semi‑sticky, rubber‑gel pads are intended for damping resonances on drums, but placing one at the edge of the drum head, placing the transducer on top, and securing it in place by slapping another Moongel on top seemed to be as secure as necessary. Moongels are inexpensive, but if you really want to do things on the cheap, a double‑sided sticky foam‑pad that you can get from a stationery shop, under the transducer, will do the job. The transducers aren't particularly delicate, but the wiring and solder joints are, so you need to make sure that something is taking the weight of the jack cable you plug into your trigger's socket. Again, I found that electrical tape did the job well enough. As you can see in the picture at the beginning of this article, I attached the cable to the metal frame around the drum, then looped the cable around with a little slack. The cable and socket are secured separately, so tugging on the cable doesn't dislodge the trigger. Here, you can see the recording from a tom trigger, a gate I'd placed first in the signal chain to clean up the signal a little, and Drumagog tracking the dynamic of the signal and triggering tom samples accordingly. You're now almost good to go. In fact, if all you want to do is trigger a single sample, without detecting any playing dynamic, you need do no more: just whack up the gain to make sure you have a healthy signal, feed the track into your triggering software, and set its transient‑detection threshold(s). If you plan to track the dynamics of your playing, though, you need to adjust the sensitivity. The obvious starting point is to use any input‑level controls on your audio interface (assuming there are any!) to bring the signal within a sensible range. It doesn't matter if the loudest hits clip, but you don't want every hit to do that, or every triggered sample will be at the same velocity. If the trigger seems oversensitive at any volume, or is picking up crosstalk from other drums (I experienced no problems with this), you need to physically isolate it from the skin and shell. For example, you could try wrapping the piezo in foam and taping that temporarily to the drum head. Getting this right is just a case of experimentation. I won't dwell on the software side of things too long, because we went into quite some detail about the pros and cons of the various alternatives last month. What I will say, though, is that I tried this trigger design with Drumagog 5 Platinum to trigger samples directly, and with both Koen Tanghe's freeware KT Drum Trigger (http://koen.smartelectronix.com/KTDrumTrigger) and Cubase 6's new hitpoint‑to‑MIDI function to drive drum libraries via MIDI. I achieved decent results with all of the above, and the dynamic tracking in Drumagog in particular worked superbly. You might find, as I did, that a gate placed in advance of your trigger software cleans things up if there are any problems such as very low-level rattles or buzzes following a hit. They're not really necessary, though; I used one simply because it was quicker than fine-tuning the trigger software. For recording drum parts at home, these triggers are ideal for me. Once I'd made one, I was able to make another within a minute (now the soldering iron was hot). I also managed to make five triggers within the target budget, rather than four, shopping around on eBay to find five piezo transducers and five jack sockets for the princely sum of £9.79 including postage. Obviously, I haven't taken into account my computer, audio interface or DAW — and I've counted the vice, solder and soldering iron as free (they can easily cover their own cost if you make your own cables! ).